Want to travel around the Kerbol system but don't know how to start? No worries! I will teach you how to go to another Celestial Body while being efficient at the same time. Let's jump in! 2.1 Where to go First? Additionally, you will need an understanding of orbital mechanics (see Tutorials section), maneuver nodes, angles, and a lot of patience. It is best to first go to Duna because of many reasons. It has an atmosphere similar to Kerbin's which is suitable for aerobraking and parachutes. It is also Kerbin's nearest neighbor and possess a moon similar to the Mun: Ike. You can find a tutorial to go to Duna here. To go to another Celestial Body, there are some essential requirements that you should have on EVERY interplanetary rocket. Make sure your target planet is ALIGNED with Kerbin. Or else, you could be drifting for years and wasting fuel until they happen to match up. The angle from Kerbin to Kerbol to your destination planet. This could be in front or behind you. The trick is to get in a position in Kerbol orbit at the same time as your destination planet. You could also use The Interplanetary Guide and Calculator to calculate your own path. Simply put, get into a normal Kerbin orbit (about ~80km). That's it! Here's a trick: If you want to go farther from Kerbin, put your maneuver node about ~45 degrees past sundown. To go to the inner planets (Eve, Moho), put your maneuver node about ~45 degrees past sunrise. Pull the prograde vector in your maneuver until the dotted yellow line crosses the orbit of your target planet (you might have to zoom out). If you set the planet you are going to as your target, you are most likely going to see two white arrows. Play with your maneuver node vectors until you get the two arrows close enough to each other that it turns into an encounter. Don't worry about the periapsis height, we'll change that later on. Face the maneuver node marker on the navball and start burning when the timer reaches half of your EBT (Estimated Burn Time). 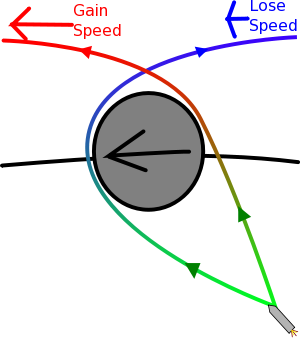 To save fuel, use the Oberth Effect by only burning for about 20 to 40 seconds at your periapsis. Just time warp around the orbit until you reach periapsis again, then start burning again. Once you get your encounter, cut the throttle. Now, we are going to change the height of the periapsis for the target planet. Put a maneuver node about ~10 days or so before your encounter. Focus your view on the target planet then use all the vectors on your maneuver node to get your periapsis to your desired height. Periapsis in the Atmosphere: You will aerobrake. Complete your maneuver node burn and you will now be encountering your target planet. Hooray! You are now entering the SOI (Sphere of Influence) of your target planet! Pass in front of a Celestial Body to brake and behind a Celestial Body to accelerate. A economical way to get to the outer planets is to preform a Gravity Assist. This is where you use the gravity of a planet to "slingshot" you into a larger and more distant orbit. A tutorial can be found here. Gravity Assists require a lot of planning - this is not recommended for beginners! You have now got an encounter with your target planet! Congratulations! With enough fuel, you can now travel around the different planets in the Kerbol system and do more advanced missions. Good luck to you! This page was last edited on 10 December 2016, at 23:23.